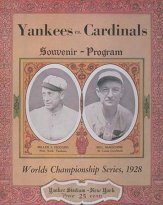 In the 1928 World Series, the New York Yankees swept the St. Louis Cardinals in four games. Along with 1927, this was the first time a team had swept consecutive Series. Babe Ruth hit .625 (10 for 16) as the Yankees demolished their opponents by a combined score of 27 to 10. Like 1926, Ruth rocketed three home run balls over the right field pavilion at Sportsman's Park in Game 4. Unlike 1926, this was also the final game of the Series and served as a punctuation mark on the Yankees' dominance. Lou Gehrig also had a good Series. He drove in as many runs by himself as the entire Cardinals team combined. Bill McKechnie became the second manager to lead two different teams to the World Series, and like Pat Moran, he won one and lost one. After coming off of a magical season, the defending champion Yankees managed to hold off the Athletics to win their third consecutive pennant by 2½games, but at a serious cost as injuries depleted their line-up. Pitcher Herb Pennock (17-6) was on the sidelines for the Series with a sore arm. Centerfielder Earle Combs was available only as a pinch-hitter because of a broken finger. Second baseman Tony Lazzeri suffered a lame-throwing arm, and Babe Ruth was playing on a bad ankle. The St. Louis Cardinals, however, were all in good shape and ready for a repeat of the 1926 contest when they had dethroned New York four games to three. For Game 1, Waite Hoyt went up against Bill Sherdel in a classic rematch of David vs. Goliath. The Babe managed to play, despite his inability to run and he and his young protégé both put on quite a show. Ruth had a single and two doubles, Gehrig went two-for-four with two RBIs and Bob Meusel knocked a two-run home run on the way to a 4-1 opening victory. Grover Alexander (who had embarrassed the Yankees and their pitching staff in the '26 Series) returned for Game 2, but lacked the dominating presence of two years ago. Lou Gehrig started things off with a three-run homer in the first inning and the Yankees continued to score without resistance on the way to a 9-3 victory. As expected, Ruth and Gehrig continued to abuse the Cardinals' pitching staff with reckless abandon. The Iron Horse launched three blasts in Game 3 for a 7-3 win and The Babe knocked three into the seats in Game 4 (with Gehrig contributing one) for another 7-3 triumph and a second sweep for the World Championship. Both sluggers had combined to go sixteen-for-twenty-seven at the plate, with a .593 average, seven homers and thirteen RBIs. Ruth set one of many Series records hitting an unbelievable .625 with ten hits in four games. Gehrig hit .545 and set his own record with nine RBIs in four games. It truly was a two-man show as the rest of the Yankees batted .196, but were supported by solid pitching by Hoyt, George Pipgras and Tom Zachary. The perennial World Champions had managed to save-face after a difficult season and once again proved that they were the best-of-the-best. Another World Series, another sweep for Murderers' Row. The Series opened in Yankee Stadium, and the Bronx Bombers took a 4-1 decision behind a complete-game three-hitter by Waite Hoyt. George Pipgras wasn't nearly as sharp in Game 2, but he didn't need to be as the Yanks scored eight runs in the first three innings off Grover Cleveland Alexander and rolled to a 9-3 victory. Lou Gehrig started the scoring with a long three-run homer in the first inning. With two runs in the first inning of Game 3, the Cardinals grabbed their first lead of the Series. But Gehrig made it 2-1 with a towering home run in the top of the second, and he gave the Yanks the lead in the fourth with a two-run, inside-the-park homer that just eluded St. Louis center fielder Taylor Douthit. The Cards scored once in the fifth to tie, but the Bombers took advantage of sloppy St. Louis fielding in the sixth, scoring three runs on their way to a 7-3 triumph. The Cardinals boasted a 2-1 lead through six innings in Game 4. But Babe Ruth led off the seventh with a home run, and when Gehrig followed with his fourth round-tripper of the Series, the Yankees owned a 3-2 edge. The Yankees piled on in the eighth, as Cedric Durst homered and Ruth blasted his third of the game. St. Louis scored once in the bottom of the ninth, but it wasn't nearly enough as Hoyt closed out the Yanks' 7-3, Series-clinching victory.